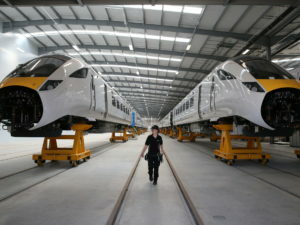 Railway-News: Why did you decide to study at the National College for High Speed Rail? MF: I was previously studying on a Level 3 rail apprenticeship scheme and was looking to push my career forward by taking the natural progression to the Level 4 apprenticeship. When I saw these were available with the college I thought it would be a fantastic opportunity to work on such a massive project, gaining new knowledge and experience while working with some of the most up-to-date technology. I thought it sounded like a really good chance to gain the Level 4 qualification with the college and make use of all the facilities they have available while still gaining key experience from an employer. RN: How do the facilities and training at the NCHSR compare with your expectations of it? MF: I think the facilities and training here exceed my expectations. The facilities are cutting edge and not like any other college around. The college gives us the chance to learn through guest lectures from people working in the industry already. The technology across the campus and the close relationships that are being fostered with professional companies are beyond my expectations. I was fairly worried I would be out of my depth at first, and thought it was going to be too much of a challenge. However, the college have helped support me where needed and have always ensured that I receive the right amount of training. RN: How does study here compare with the training you receive on your regular apprenticeship, and how, if at all, does it affect your experience of it? MF: I think the training has a huge impact in the progression of our apprenticeship. Having training at college has meant I am able to put the things at work into a greater context and vice versa. For example, the particular decisions they make on the project; learning the information in college makes me understand why things are done a certain way. RN: Has studying with apprentices from other schemes across the UK made a difference to your experience of the training? MF: I feel working with people from all different experiences benefits the group far more. I feel it benefits us massively when working in groups together. We all have different experiences, knowledge and skills and therefore can all contribute something different to the group. It is giving us a chance to learn new things from each other and use all our skills collectively to produce the results required. RN: Do you think that the resources at the college will improve your prospects of a career in rail and your capacity to do the work? MF: I feel the resources at college are going to benefit my career massively. From the technologies they offer and from the experience we gain from the college; including the networking opportunities, the close relationships they have with employers, and the training itself, from lectures to school presentations. I feel that by learning all this from the college, we have chance to build our skills and understand what is required of us to give our careers a head start. As one of the first apprentices on the project, I’ve already seen the opportunities available from both the college and my employer. I think having all this experience is going to open a lot of doors in the future, especially as the project progresses. FOR ALL THE LATEST INFORMATION, NEWS, IMAGES, AND VIDEOS ON ALL ASPECTS OF RAILWAY EDUCATION / TRAINING, PLEASE CLICK HERE.